EnricoTam | Web 3.0 - The world computer? 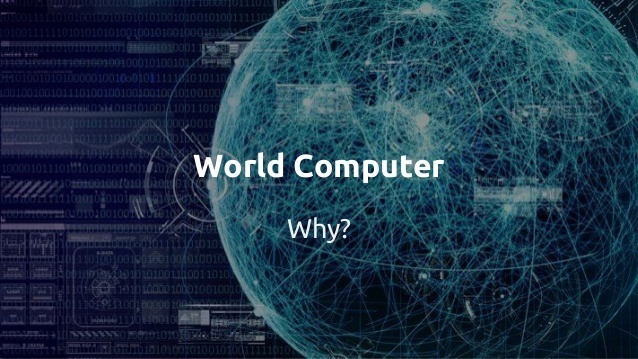 Web 3.0 - The world computer? More and more people are starting to talk about Web 3.0. But what is it exactly? It is believed to be a smarter version than the current one, and one in which data, concepts, applications and, ultimately, people will be connected through technology. To make it possible, we need a truly decentralized world, where everybody contributes to the safety of the network. Think of how the Blockchain technology made it possible for a decentralized currency like BitCoin to become mainstream. Here we find the decentralized logic required to enforce rules and to keep order in the system. Etherium is currently the state-of-the-art technology for so-called smart contracts. Single computers will store data in a decentralized way. There is no need to store all the data in one computer. Single computers in the network will make money by hosting packets of data. Computers requesting data that they do not store will find these data somewhere in the decentralized network and pay a small fee to retrieve it. Swarm is an attempt to achieve decentralized storage in the Etherium network. Swarm is not tied to a specific physical storage system. It could be IPFS, BitTorrent, or some future technology not yet invented. A decentralized communication system will take care of the communication inside the network. Whisper is being developed under the Etherium platform to let apps broadcast messages securely between users. Please note that the above-mentioned elements will need to be independent of each other for the system to work.